Whether yours is a small garden, courtyard or balcony, or you want to group pots on a patio, container gardening is a vital element in any garden design. Plus, when you move house, you can take your containers with you. Find out how to create and care for a container garden with this expert advice. If you are integrating containers into a brand new garden, find out how to design a garden from scratch in our guide. Many gardeners use containers, pots and planters for seasonal plants, such as bulbs in spring, colourful bedding in summer, and grasses or foliage plants through autumn and winter. Container gardening allows you to ring the changes year on year, trying out different combinations, alternative colour themes and a range of plant varieties. You can also grow fruit and veg in containers, and it's a good option for growing organic. Find out how to grow organic fruit and vegetables in our guide. Experiment when container gardening. Use pots to assess the success of various plant combinations. Try something new, change it immediately if it does not work, or give it a few weeks and then alter the arrangement if necessary. Plants can be moved around to suit their needs: spring-ﬂowering shade-lovers can be given the pride of place when they are performing, while tall pots filled with compact summer annuals can be inserted into the middle of a border to fill seasonal gaps. Tender, even sub-tropical, plants can be placed outside for the summer, where they are more likely to stay healthy and pest free. They can then be moved back indoors for winter. Different soil conditions can be provided for, allowing for plant combinations that would be impossible in the garden. For example, you can place pots of lime-lovers, such as dianthus (pinks) alongside lime-haters, such as skimmia and rhododendron species, or bog plants next to dry habitat species. The wide array of containers on the market offers something for every garden size and style. Modern materials, such as glass ﬁbre, resin, plastic, or wood composite, which imitate natural materials that are either very heavy or expensive are particularly hardwearing. Terracotta, stone and lead imitations of historic models make life much easier and cheaper for those who want to evoke a classical look in their garden or on their terrace. They are also lighter and therefore safer if you are designing displays for a balcony or roof garden. Rustic materials – wood and other natural materials – are useful as skins or screens for more durable pots. For example, basket-like structures made from woven willow can be used to conceal an unattractive or purely functional plastic container, and the life of the willow will also be prolonged because it is not in contact with wet compost. Vintage materials provide plenty of scope for container gardening. All sorts of products can be reused as a plant container: old metal buckets, drainage pipes, bulk food containers, oil cans – the options are endless. Just remember to drill drainage holes in the bottom of your vessels to ensure your plants don’t drown, and check that they were not used to hold harmful chemicals in a previous life. Some pots are more suitable for plants than others. The larger the container, the more compost and moisture it will hold, and therefore the less frequently you will have to water it. Traditional pots, which are wider at the top than the bottom, are perfect for plants, since they provide plenty of space for the roots to grow, and you can remove them easily when you want to re-pot them. A taller pot, which offers even more root room, is vital for some plants and the best choice for many shrubs and climbers, such as roses and clematis. Plants are more difficult to remove from straight-sided containers, while wall pots with very wide semi-circular tops and narrow bottoms dry out rapidly and are unsuitable for most plants apart from succulents, unless you can water daily in warm or dry weather. 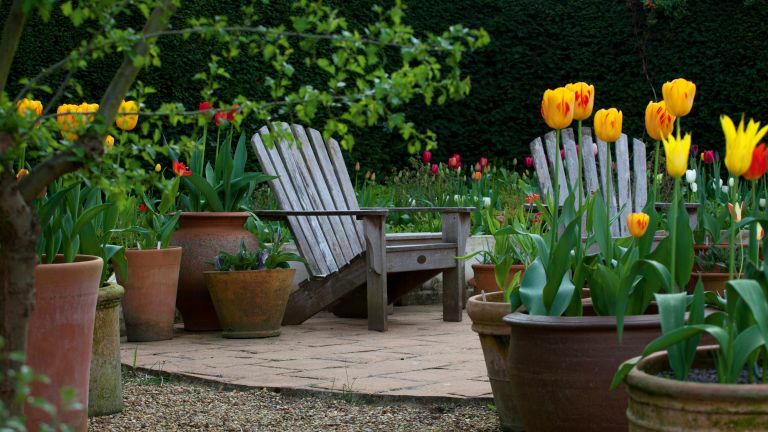 Pots with an incurved top, such as small-necked urns, make it hard to remove established perennial plants without damaging either plants or container; if you like this style, avoid these problems by planting up a small plastic pot that ﬁts snugly into the neck of the urn. Shallow containers that are less than 20cm in height provide a restricted area for rooting and are prone to drying out. They are only suitable for small plants, but can make decorative garden additions if watered frequently. A very shallow container with a depth of less than 10cm is traditionally used for growing diminutive alpine plants. Many species, such as varieties of dwarf dianthus, flower in spring, so choose those with evergreen foliage, including sedums, phlox, and sempervivum, for a longer season of interest. Choosing plants fo your containers is the fun part, whether you're picking contemporary, architectural plants or picking traditional blooms. If you need more general advice, find out how to choose plants for your garden in our comprehensive guide. Place taller plants at the back of potted displays and shorter at the front. Providing long-term colour and texture, many perennials are perfect for container gardening, but most will need to be lifted and divided after a couple of years. Tallest at the back, shortest at the front. This is a basic principle for traditional border planting and a good starting point for containers, too. In small spaces it ensures all plants can be seen and the shorter forms hide the sometimes less attractive lower stems of taller ones. Rely on mass. Plants fall into one of three basic categories: tall and upright, medium-sized mass, small and spreading. If most of the plants used fall into the middle category, they will give your container combinations weight and physical presence. Limit the drama. Don’t overdo plants that draw attention to themselves, notably those with height, or dramatic or large leaves. Check that their stems and leaves have sufficient space. Pack them in. Seasonal plantings, such as annuals, look best if they are exuberant and fulsome. Closely packed annuals in a container will need regular watering and feeding. Less is more. Paring back the number of shapes, shades and species will create a more sophisticated look in a container. Remember the little ones. Small spreading plants, including alpines and succulents, also need full sun, so pot them up separately and ensure they are not overshadowed in the container. Plants in pots need constant care as their roots cannot extend outwards and reach down to draw on the moisture reserves in the ground; likewise, nutrient levels can quickly become depleted. Container plants are also far more vulnerable to temperature extremes: in winter the compost will freeze more quickly and more thoroughly than the soil in the ground, and it will also heat up and dry out rapidly during the summer months.